Want a Center Shafted Putter? - Find out which are the best with genuine, hands-on reviews! A center shafted putter is exactly what it seems to be - a putter where the shaft inserts into (more or less) the center of the head. They are usually face balanced, so they will best suit a straight-back-straight-through stroke. If your putting stroke is more of an in-square-in stroke, then you may well be better off with an anser style putter or a blade putter. Click on the links below to find out which center shafted putter is the best with www.Best-Putter.com's independent, hands-on reviews, you'll also find where to buy them at the best prices! 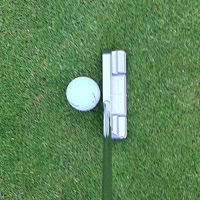 Probably the most recognisable center shafted putter is the Bullseye, shown above. This putter won hundreds of professional events between the 1950s and 1990s. There are now many different shapes of putter which have the shaft in the center as you can see from the pictures below. Perhaps a center shafted putter is not for you? Click here to find out about different putter types and which will suit your stroke!